Bringing a child into the world is such an exciting time in a woman’s life and during the time of pregnancy, women’s bodies undergo many significant changes. 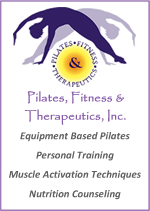 Pilates can be beneficial in offering modification to exercise while providing many great ways to stay strong and fit. Pilates emphasizes prenatal women both core and joint stability while reducing stress and strengthening of the entire body. Encouragement of the pelvic floor is encouraged to assist in activating the deep stabilizing muscles of the lower back which often grows tired during the length of the pregnancy. Exercises can be performed both on the mat or equipment with supervision of a qualified instructor. For your health and safety, please check with your physician before starting an exercise program.